Yesterday I went to NTNU to (finally) (hopefully) get things squared away with my scholarship papers. Yay money. Then, because I didn't want to have just gone all the way on the metro to NTNU for that one errand, I decided to walk around a bit. 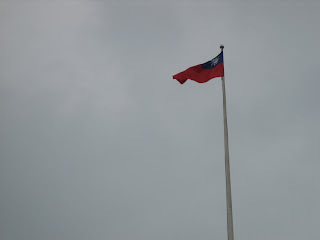 I saw signs pointing the way to the Chiang Kai-Shek Memorial Hall (國立中正紀念堂) (since renamed the National Taiwan Democracy Memorial Hall), and followed inspiration (and my awesome newly developed sense of direction). 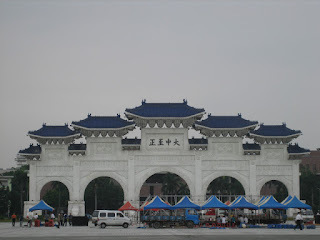 The Concert Hall to the left of the Memorial Hall (facing the memorial hall), and the Taiwanese Flag in the center of the square. 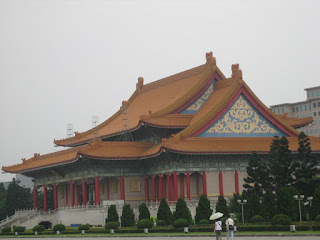 The National Theater directly opposite the Concert Hall is under construction, so I didn't take any pictures. 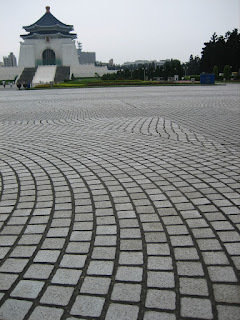 I really liked the walkway patterns they laid throughout the park. And I also really like this picture. So, anyway. Went through the Memorial Hall, but the main hall was closed due to...well, your guess. It was a grey, drizzly day, not optimal for digital camera pictures, but I had fun. 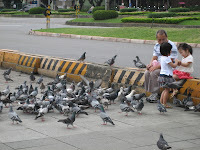 I walked to the Memorial Hall metro station (unintentially, I just picked left outside the gate), where a grandfather and (guessing) his two grandchildren were feeding pigeons. I was planning on meeting relatives for lunch, but wanted to explore more, and didn't feel like getting on the metro so soon. I got the general gist of how to get to the Taipei Main MRT from a map by the station and went off down ZhongShan South Road (中山南路). Took a good 15 minutes or so to get to Taipei MRT, but it was a refreshingly cool, breezy day, so it felt nice to be out and about. Let's see...had lunch with the fam at a restaurant in the Breeze Center* called..."Japanese Restaurant." But the food was good, so no complaints or snide remarks at my end. We walked around the mall for a bit, before heading back to 2nd Aunt's house to rest. Then my cousin Ingrid took me to nearby Taipei Arena for a bout of ice skating! Fun, tiring, and I didn't fall. A success! Except for the blisters on both ankles. Now I'm inspired to get my own skates (and gloves) and try to go there regularly. Perhaps I can get some classmates to go with. Today's adventures will have to come in a future post, because it is late, this post is long enough as it is, and my laptop's getting hot.